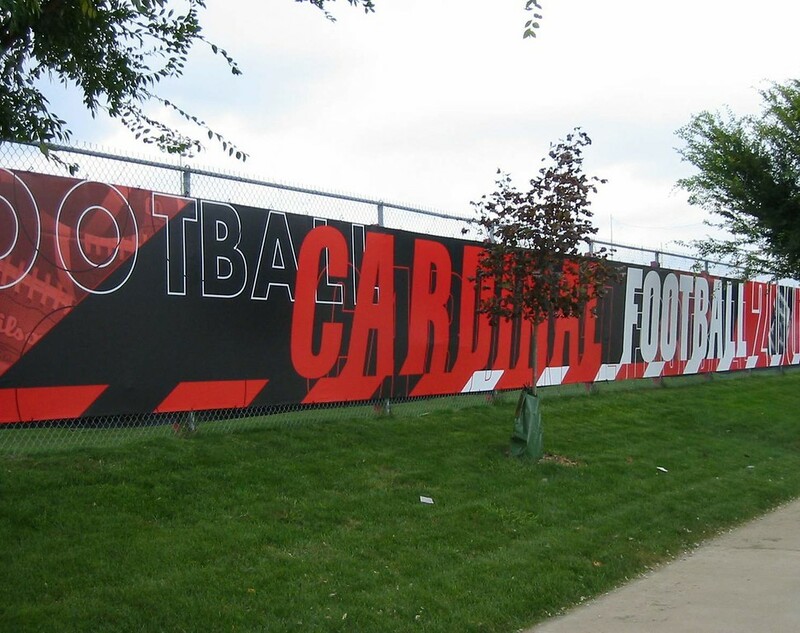 Whether you are wrapping football bleachers or providing windscreens for baseball, softball, or tennis; Toadvine offers a variety of both open and closed mesh banners & windscreens with high quality graphics to meet the needs of your athletic facility. Windscreens are important not just for reducing the effects of wind or providing cover, but more importantly as a form of brand promotion for your school. With high quality graphics, windscreens can also be used as awesome branding assets with sponsorship opportunities. Many schools have found branding their facility enhances the fan experience, increases community engagement, and boosts their athletic programs image, school spirit, recruiting, and team pride. By selling sponsorship space on windscreens, you can create revenue to offset costs for athletic facility enhancements like outdoor grandstands, indoor bleachers, gym equipment, scoreboards, and outdoor athletic equipment. Sponsors will welcome the visibility and goodwill they can generate for their business with the community.